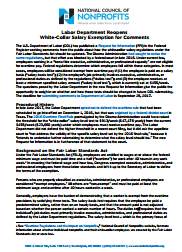 The U.S. Department of Labor has published a Request for Information (RFI) in the Federal Register seeking comments from the public about how the white-collar salary regulations under the Fair Labor Standards Act should be updated. The Obama Administration had sought to revise the same regulations, but that effort was blocked by a federal court in late 2016. Under current law, employees working in a “bona fide executive, administrative, or professional capacity” are not eligible for overtime pay. The questions posed by the Labor Department in the new RFI give the public the opportunity to weigh in on whether and how those tests should be changed in future DOL rulemaking. Unless a significant number of individual nonprofits submit comments to the Department of Labor by September 25, 2017, the impact of future regulations on the nonprofits sector will be defined by academics, for-profit management groups, worker rights organizations, bureaucrats, and others based on assumptions and data from other sectors. The National Council of Nonprofits encourages all nonprofits to conduct a mission-based analysis of the law and questions presented in the RFI. That means answering questions about how an increase in the minimum salary levels would affect operations, resources, and staffing, as well as what impact changed regulations would have on the people relying on the services and the mission of the nonprofit. For more information, including background on current law and annotations that explain several of the questions presented in the RFI, see the National Council of Nonprofits analysis, Labor Department Reopens White-Collar Salary Exemption for Comments. The deadline for submitting comments to the Department of Labor is September 25, 2017. Debt Ceiling: The federal government reached its statutory borrowing limit many months ago, and the Treasury Department has been using “extraordinary measures” to continue funding government operations without incurring more debt. Treasury Secretary Mnuchin warned in a letter to Congress late last month that Friday, September 29 is the hard deadline for Congress to raise the debt ceiling or the government will default on loans. Congress could simply raise the borrowing limit to a new level or suspend the law for a period of time, but so far bipartisan negotiations have not reached agreement on what action Congress will take. Historically, some in Congress try to use the debt ceiling deadline to extract legislative concessions as their price for averting default or a government shutdown. Thus, talk of a "clean” vote to increase the debt ceiling means a bill without policy riders to sweeten the deal to entice yes votes. FY 2018 Spending: The new fiscal year begins on October 1, but Congress has not yet enacted any of the dozen appropriations bills that fund the federal government and thousands of programs that hire nonprofits to deliver services to the public in communities across the country. The House passed a bill that merged four of the spending bills related to national security, but that bill has been called “dead on arrival” in the Senate because it contains numerous controversial provisions. For its part, the Senate has not taken up any appropriations bills, and the Senate Appropriations Committee has approved only half of the 12 spending measures. In September, both chambers are expected to attempt to enact some appropriations legislation for fiscal year 2018. Most observers, however, expect the month to end with Congress approving a short-term “continuing resolution” that will maintain level funding for all programs until late November or December. Budget Resolution and Budget Reconciliation: Ordinarily, Congress would pass a budget resolution that instructs the appropriations committees on how much they can spend in the upcoming fiscal year. This is not an ordinary year. The appropriations committees have been crafting bills without knowing how much spending will be approved because neither the Senate nor House Budget Committee has approved a Budget Resolution, although the chairs of both are promising committee and floor action in September. A budget resolution with so-called reconciliation instructions is considered necessary to passing a Republican tax overhaul in the Senate with a simple majority and without needing support from Democrats. Read more about the federal budget process. Budget Control Act: Congress agreed in the Budget Control Act of 2011 that it would spend roughly equal amounts each year on the defense and the non-defense sides of the federal discretionary budget. The plan by congressional Republicans to exceed overall spending limits by increasing defense spending by $70 billion in FY 2018, however, would violate that law, which mandates across-the-board spending cuts in both defense and non-defense programs to meet pre-determined caps. This automatic procedure is known as “sequestration” and can only be avoided by changing the Budget Control Act, meaning that a bipartisan deal will be needed. Non-Itemizer/Universal Charitable Deduction: “Charities stand to lose billions in donations if Republicans advance their tax overhaul,” according to the Wall Street Journal. The article, Charities Coax Lawmakers to Rethink Tax Plan (paywall), cites a study by Indiana University forecasting that the plans by some congressional leaders to double the standard deduction and lower tax rates would reduce charitable giving by about $13 billion annually. But the article also cites a report issued last week by a DC-based think tank, the Tax Foundation, which claims that extending charitable deductions to non-itemizers would reduce federal revenues by $191 billion over 10 years if no other tax laws were changed. In the context of comprehensive tax reform, including doubling the standard deduction, the study calculates the lost to the Treasury at $515 billion over ten years. Bipartisan Health Hearings Announced: In the aftermath of the failure by Senate Republicans to advance a bill to repeal and replace the Affordable Care Act, two Senate committee chairmen announced upcoming bipartisan hearings to seek common ground. Both the Senate Health, Education, Labor and Pensions (HELP) Committee and the Senate Finance Committee will hold public hearings in early September. According to HELP Committee Chairman Alexander (R-TN), the goal is for the panel to craft a short-term proposal by mid-September to stabilize markets to help insurers finalize how much their premiums will cost by the end of the month. The Finance Committee is expected to focus on reauthorizing the Children’s Health Insurance Program, which is set to expire on September 30. Legal Groups Allowed to Help Immigrants: The Justice Department’s attempts to curb legal assistance to immigrants facing deportation is unlawful, a federal judge in Seattle ruled last month. The Justice Department Executive Office of Immigration Review had issued a cease-and-desist letter to Northwest Immigrant Rights Project citing an attorney-misconduct rule as a means to stop the legal aid group from providing certain legal assistance unless able to fully represent immigrants in court, a time-consuming and costly endeavor. In issuing a preliminary injunction, the judge found that the restrictions violated the immigrants’ First Amendment rights to seek legal assistance. The Financial Accounting Standards Board (FASB) is seeking public comments on a draft Accounting Standards Update (ASU) for recognizing revenue from grants and contracts (Topic 958). The proposed revision is intended to improve and clarify the distinction between “contributions” and “exchange transactions” for nonprofit organizations to encourage greater consistency in how nonprofits account for the revenue. If approved, it is likely that more grants and contracts will be considered contributions, which would then need to be categorized as either conditional or unconditional to apply the proper accounting procedures. A conditional contribution under the proposed revision is typically what nonprofits currently refer to as an exchange transaction or contract. As a result, the draft makes the curious assumption that a government entity does not receive reciprocal value from a nonprofit providing services on its behalf (which is why it is not considered an exchange transaction). FASB is seeking public comment on the proposed changes until November 1, 2017. Housing advocates reacted swiftly to counter the President’s budget proposals calling for significant cuts to numerous programs designed to promote affordable housing. The results so far have been mixed. Spending bills approved by the House Appropriations Committee call for restoring $10 million to the Self-Help Homeownership Opportunity Program (SHOP). However, a bill approved by the House Appropriations Committee would make significant cuts of $100 million to funding for the Community Development Block Grant program (CDBG) and the HOME Investment Partnerships Program (HOME). The Senate Appropriations Committee approved level funding for SHOP, CDBG, and HOME. The House and Senate could vote in September on some or all of these issues as they work to enact bills to fund the federal government into the next fiscal year that begins on October 1. Habitat for Humanity and others are urging Members of Congress to support adequate funding levels for housing programs. The possibility of federal cuts to domestic programs, whether by design or sequestration (see lead federal article above) carries additional ramifications when factoring in that states on average receive 31.9 percent of their revenue from the federal government and many states remain in unsteady fiscal conditions. Several states began the new fiscal year on July 1 without budgets, and even now, six weeks later, three states still have no budget: Connecticut, Pennsylvania, and Wisconsin, creating undue burdens on nonprofits. “With no state budget, nonprofit organizations that hold contracts with the state [e.g., to provide disability services] have not received the money that they normally get to run their programs,” the Hartford Courant reports. Connecticut lawmakers reportedly are negotiating additional cuts of $100-$150 million in social services performed by nonprofits. Even among states with budgets in place, several are already facing challenges, including: Kentucky (experienced a $138 million revenue shortfall in the first year of its two-year budget), Louisiana (where the scheduled expiration of temporary taxes threatens to create a billion dollar shortfall), Montana ($75 million deficit led to announcement of “severe” cuts), New York (State Comptroller “is calmly ringing alarm bells about the New York economy and budget outlook” as tax collections fell by $1.2 billion), and Oklahoma (where the House will hold a series of special budget meetings “to find a way to achieve a stable budget” as the state supreme court this week considers invalidating the state budget). And while Illinois finally has its first state budget in two years, the state has a backlog of unpaid bills totaling $15 billion, including to nonprofits for services they delivered during the last two years. The changes to Arizona’s laws that voters approved in 2016 to raise minimum wage (from $8.05 per hour to $10 per hour in 2017 and up to $12 in 2020) and require employers to provide paid sick leave are valid, the Arizona Supreme Court ruled last week. The state Chamber of Commerce and Industry and other employer groups had strongly opposed the ballot measure that Arizona voters passed in November 2016, and then filed suit to block implementation arguing that the ballot measure violated technical processes required by the state constitution. The court – focusing on the ballot measure requirements, not the substance of the minimum wage law – unanimously rejected those arguments. The North Carolina General Assembly gave final approval last week to a broad business regulatory reform bill that includes two provisions that could help nonprofits. One part of the bill would require the Office of Administrative Hearings to create an online clearinghouse for proposed rulemaking by state agencies, creating greater transparency about potential regulations that affect nonprofit operations. Another provision would modify rules for health benefit plans to make it easier for nonprofits and small businesses with fewer than 26 employees to get stop-loss or catastrophic insurance coverage for their employees. The bill now goes to the Governor for his signature. The Mayor of Denver, Colorado released a draft executive order that would prohibit local law enforcement and jail deputies from supporting immigration efforts of the current administration. Specifically, the draft order prevents city employees from permitting federal Immigration and Customs Enforcement officers into secure areas to arrest immigrants without a warrant or maintain written information about foreign nationals in local jails. The order would remain in effect until the last day of President Trump’s current term, and comes after two City Councilmembers offered a stricter proposal that would stop deputies from notifying federal authorities about releasing inmates wanted on an immigration detainer. Both chambers of Congress have now officially recessed for the month of August. That means many Senators and Representatives are now back home meeting with those they serve, including nonprofits. As any nonprofit advocate will tell anyone who asks, meeting elected officials in their state or district offices can be one of the best ways to focus their minds on the issues important to you and to build relationships that help advance your mission. 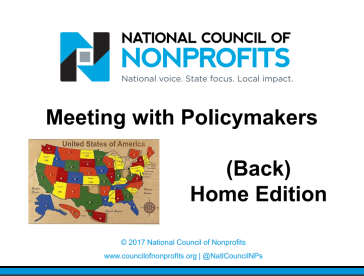 Why Meet with Policymakers in Their Districts/States? There are many reasons why meetings back home can be more productive than traveling to the state capital or Washington, DC. For one, there’s usually more time to talk because lawmakers’ schedules are usually less compact and there aren’t the distractions of votes and committee meetings. Local meetings mean less travel time, making it more convenient for all to participate. Meeting locally also gives the organizers the opportunity to bring the absolute right people to the meeting – whether a board member, friends of the elected official, experts, beneficiaries of nonprofit services, and others who can help deliver the message. And a reason not fully appreciated by many, you’re doing the policymaker’s staff a favor by scheduling meetings to keep her or him busy, and not coming up with more projects for staffers to be working on. Before deciding that you want to meet with the policymaker, it’s good to figure out what you want to talk about. Is there one pressing legislative issue, or several, you plan to bring up, or is the goal to use the meeting to build a relationship for future engagement? 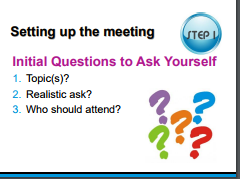 The webinar discusses several ways to propose and set up the meeting, using the goals to shape the request. The second step is very much like any meeting with several participants, meaning it’s important to put together the handouts that will be used and get everyone on the same page and work through who is doing what in the meeting. TIP: Send the written materials to the policymaker’s office the day before the meeting or further in advance so the time spent in person can focus on your desired message and answering questions rather than reading. The webinar walks you through the roles various participants play. 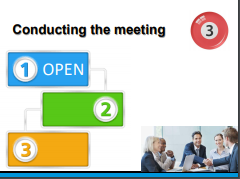 These include the Opener (often the person who set up the meeting) who gets things started and briefly explains the issues/problems that bring people to the office. Other individual attendees introduce themselves, explain what their organization does, and how the issue affects the organization’s mission or how the individual is personally affected by the problem. The Closer’s role is to not let the meeting end without asking the policymaker whether he or she will take the action requested. A step that cannot be emphasized enough: follow up. Send thank you notes to the elected official and every staffer who helped set it up. Then it’s essential to send any extra information promised. And then, follow up again when the issue is hot, reminding of the meeting and commitment made earlier, or asking again for support of your position. Please take a look, share with others as you see fit, and give us feedback on whether the webinar is helpful and how it can be improved. Thanks! The fundamental of nonprofit nonpartisanship is under attack in Congress. Join more than 5,400 organizations – charitable nonprofits, religious institutions, foundations, and for-profits from across the country – by signing the Community Letter in Support of Nonpartisanship. Learn more at www.GiveVoice.org. Take Part in National Voter Registration Day 2017! 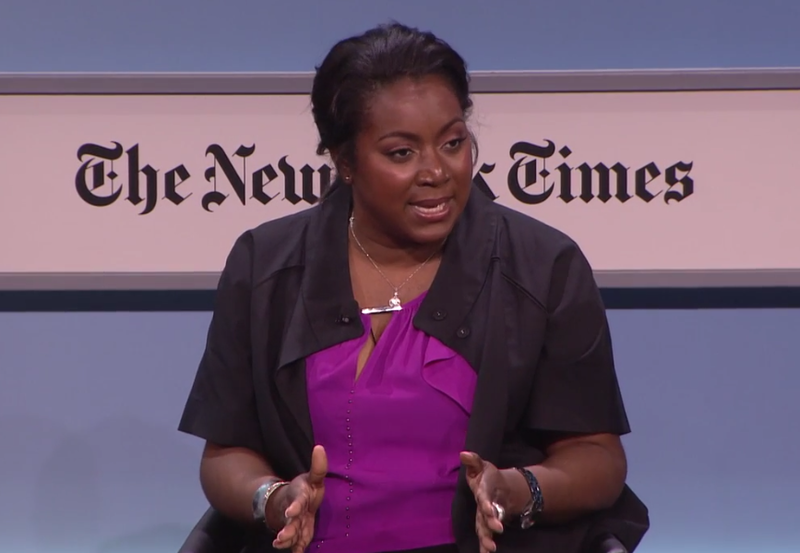 - Margarette Purvis, CEO of the Food Bank for New York City, appearing at “Cities for Tomorrow” conference hosted by the New York Times, video posted August 7, 2017. How tax reform could hit charitable giving, Jeanne Sahadi, CNN Money, August 6, 2017, reviewing the impact that would occur on charitable giving if Congress lowers tax rates and doubles the standard deduction as components of comprehensive tax reform. - “Keep political campaigns out of the churches,” Los Angeles Times editorial, July 25, 2017, explaining the fundamental principle of the law on nonprofit nonpartisanship and expressing strong opposition to the extraneous rider attached to a House appropriations bill that would effectively block enforcement of the Johnson Amendment if churches engage in partisan electioneering activities, such as passing the collections plate to raise funds for candidates for public office. “Lawmakers Strike Back Against Voter-Approved Ballot Measures,” Elaine Povich, Stateline, July 28, 2017, examining the actions of lawmakers in Florida, Maine, Massachusetts, and South Dakota to undo the changes in law from voter-approved citizen initiatives in 2016, and efforts in Arizona and other states to restrict the ability of citizens to use the ballot initiative process in the future. 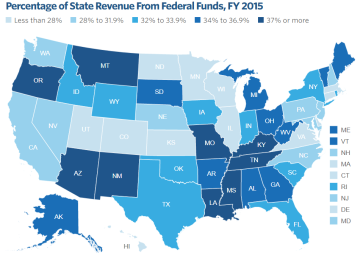 The average share of state revenues made up of federal dollars in fiscal year 2015, the third-largest share on record, and up from 30.7 percent in fiscal year 2014. Source: Federal Share of State Revenue, Pew Charitable Trusts, August 4, 2017. Review the interactive data for the latest information on your state and comparisons with others. Copyright 2017 National Council of Nonprofits. All rights reserved.